Earth Hour is a global event organized by World Wildlife Fun and is held on the last Saturday of March annually, asking households and businesses to turn off their non-essential lights and other electrical appliances for one hour to raise awareness towards the need to take action on climate change. For 2011 that special one hour falls on 26th March, from 8.30pm to 9.30pm local time. 3. In 2009 more than 100mil people from over 4000 cities and 88 countries touched the switches. 4. In 2010 enormous responses from more than 128 countries, no estimate given but it should not be less than half a billion people. Earth hour has transformed into a kind of celebration with a lot of activities towards making the public aware of the need to safeguard earth from negative climate change. Concerts, seminars, workshops, photography contests, beauty pageants, power-saving campaigns; it's like you-name-it-we-have-it kind of thing. This year DBKK (Kota Kinabalu City Hall) is organising a photography contest. Good opportunity for photographers and hobbyist. I can't take part on this one but would definitely take part on the switching-off of non-essential lights. 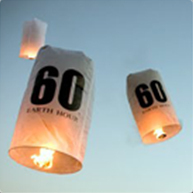 Do visit Earth Hour official website and have fun making your very own lantern lights. 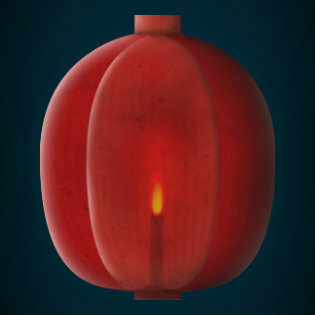 This is what I got from there and I like the lantern to be red in colour. Happy Earth Hour day on 26th March 2011.
bangga menjadi salah sorang yg menjayakan Earth Hour.. Better Way to Unleash "That Talent"..? Cartoonist - Out of his mind? Fluoride, Silent Killer - Or is it?